Diet of Worms: the name sounds so strange to English-speaking ears that it seems to be a joke. It's not. A diet, pronounce dee-et with emphasis on the second syllable, is a formal conference of princes. Newly elected German king and now emperor of all Europe, Charles V, convened a diet in the German town of Worms on January 28, 1521. It's primary concern was not Martin Luther, but the popular, rebellious monk—and prodigious author— would have to be addressed. The emperor didn't know what to do. He was a loyal Catholic to the end. Thirty-four years later he would resign his multiple crowns to die a monk. He needed the pope's support, but he was also grateful to Frederick the Wise, Elector of Saxony and a Luther supporter, who had declined a nomination to be ruler of Germany, securing Charles' election. He was also not stupid. Carrying out a strong action against Martin Luther could ruin his leadership in Germany, especially since he was king of Spain before he was king of Germany. When he tested the waters at the Diet of Worms by recommending harsh action against Luther, the Estates of Germany resisted him, and he backed off. It was impossible not to notice the support Martin Luther had among the Germans. Not only did the German Estates not want to enforce the papal bull, but the people were so wildly supportive that Aleander wrote that nine-tenths of the Germans considered the name of Luther a war cry, and the other tenth was calling out, "Death to the court of Rome!" Thus, the emperor decided to talk to Luther and promise him safe passage. Even Aleander agreed not to push any punishment on Luther except excommunication if he did not recant. 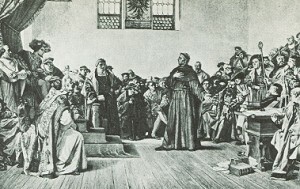 Luther went gladly to the Diet of Worms, anxious to defend his doctrines. He was all the more encouraged by the support of his friend, Philip Melancthon, a brilliant and able scholar. He told Philip that if he were put to death, he would be comforted, for he knew that Philip could defend the truth better than he. Martin Luther spent 10 days traveling the 300 miles from Wittenberg (near modern Berlin) to the Diet of Worms (south of Frankfurt), where he knew his life would be in danger. 106 years earlier, John Huss (or Jan Hus), considered by all involved a predecessor of Luther, had been burned at the stake despite a similar promise of safe passage. Luther, though, would not be turned aside. "I shall go to Worms," he said, "though there be as many devils as tiles on the roofs" (ibid., ch. 3, sec. 54). Luther was brought into the diet the day after he arrived. It was April 17, 1521. Twenty-five books were laid before him on a table, and he was asked two questions, given in both German and Latin. He hesitated, apparently intimidated by the setting and huge crowd of dignitaries, and he acknowledged in a barely audible voice—both in Latin and German—that they were his. He then asked for time to consider the second question because the matter involved the salvation of his soul and the truth of the Word of God. The emperor gave him a stay of one day, a day that would be one of the most famous in history. Luther had time to think and to discuss things with friends. He gathered himself, and he returned to the Diet of Worms as composed and brave as he had been intimidated the day before. The moderator, Johann von Eck—a different Johann Eck than the one he debated in 1519—phrased the question differently on this 2nd day of the trial at the Diet of Worms. He asked if Luther would defend all his books, or whether he would recant any part. Luther's response was fascinating. He divided his books into three parts. Books on simple evangelical truths that even his enemies agreed with: These he could not recant. Books against the corruption of the papacy: These he could not retract without cloaking wickedness and tyranny. Books against his popish opponents: These he admitted were too vitriolic; however, he could not retract those either, lest his enemies triumph and make things worse. I don't know that a German would find this hilarious, but as an American Christian, for whom beer has such a negative connotation, I laughed out loud when I read the following story. A supporter, Duke Erik of Brunswick, saw how tired Martin Luther was when he left the diet, so he sent him a silver tankard of Eimbeck beer. He drank out of it himself first to assure Luther that it was not poisoned. Luther, grateful, said, "As Duke Erik has remembered me today, may the Lord Jesus remember him in his last agony." Later, on his deathbed, the duke thought of that tankard of ale and claimed the words of the Jesus, "Whoever shall give to one of these little ones a cup of cold water in my name, he shall by no means lose his reward." Martin Luther, then, amazingly and in an act of great boldness, exhorted the young emperor, 17 years his junior, not to begin his reign by condemning the Word of God. He reminded him of the judgments against pharaoh, the king of Babylon, and the ungodly kings of Israel. All this he said in German. He was requested to repeat himself in Latin, which he did with equal candor. Because he had also added that if his works were proven to be false by Scripture, then he himself would burn his own books, Eck asked him to give a straighter answer. His views had already been refuted, Eck said, by the Council of Constance. Give us a direct answer, he demanded, "without horns." This irritated Eck who began to dispute with him about whether councils could err. Finally, Luther could bear the dispute no more. Here I stand! I cannot do otherwise. God help me! Amen. With these words, Martin Luther's trial at the Diet of Worms came to an end. The emperor was young, but he had some honesty. He honored his promise of safe passage. 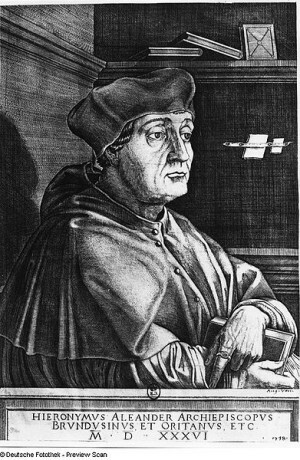 He gave Martin Luther 21 days to return to Wittenberg, after which time he would treat him as an obstinate heretic, which meant most likely that he would be put to death. Luther accepted the safe passage from the Diet of Worms, and began to make his way to Wittenberg, but it was along the way that his protector, Frederick the Wise of Saxony, had him snatched by soldiers and delivered to Wartburg castle, near Eisenach. Martin Luther's fascinating story, and some details about the enigmatic Reformer's life are given on the Martin Luther page.